A practical addition to your gigbag to record both audio and visuals. Useful in a range of applications. Carefully considered controls and connections. Touchscreen can be fiddly for the large fingered. If you play in a band or are a solo artist, there are more opportunities than ever these days when it comes to self-promotion and making money from music - posting videos on YouTube, selling your music on iTunes and more. Of course, you need technology to make that happen, and the Q8 from Zoom seems to tick a lot of the relevant boxes. It's a portable video and audio recorder that offers high-definition video and quality audio recording (up to 24-bit/96kHz), so could be a great choice for recording the visuals and music together at a gig. "Four channels of audio can be recorded simultaneously with or without video"
Light and easily portable, the Q8 can be hand-held but lends itself to being in a fixed position on a stand courtesy of the tripod mount on its base. The unit runs off a rechargeable lithium-ion battery and records to an SD card (not supplied). Four channels of audio can be recorded simultaneously with or without video. There's a stereo track that can be recorded using the attached X/Y mic (Zoom has an interchangeable mic capsule system with a range of other mics available), and there are a pair of XLR/jack combo inputs to take mic or line inputs for the other two tracks, which can configured as a stereo pair or separate mono tracks. A built-in speaker and stereo headphone/line output jack take care of audio monitoring. Four different recording modes are selectable: video with audio, video with separate audio files, stereo audio, or multi-audio. Setting up is a relatively straightforward process, using a rotatable touchscreen that also serves as your video monitor, although anyone blessed with fat, podgy fingers might initially find negotiating the menus a bit fiddly. Once set up, recording is initiated with a press of a single red button. Physical controls are, in fact, kept to a minimum - just the necessary buttons for playback and to arm the tracks, and easily-adjusted input gain dials for the mic and the two inputs. 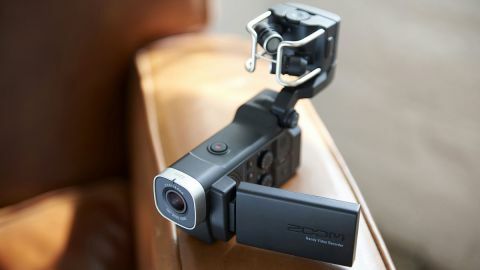 "It also supports live streaming and the Q8 can be used as a webcam or USB microphone"
For the video, you get a 160-degree wide-angle lens with digital zoom and a choice of formats up to 2,034 x 1,296 pixels (3M HD), with frame rates of up to 60fps at 720p. There's a HDMI output for video monitoring. A USB connection transfers all .mov files and .wav files to your computer for editing. It also supports live streaming and allows the Q8 to be used as a webcam or USB microphone. So, is it for you? Well, in a band you can be videoing the gig while recording the audio in the room with the mics and recording a feed from the mixing desk onto the other tracks - all time stamped and synchronised for editing later. A solo performer could record the stereo sound in the room alongside separate tracks of acoustic guitar and vocals. There's also use as a pure audio recorder for capturing song ideas and the like. Overall, the Q8 is a creative tool that could expand your musical horizons.